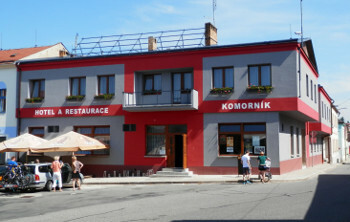 Hotel Komorník is situated in calm center of Strmilov. There is a post office, shops, bus stop, sports hall, tenis curts and put-put playground near the hotel. All rooms in the hotel were completly reconstructed in 2010, so they respect requments for modern hotel. Hotel has also its own restauration, which was completly reconstructed in 2005. Strmilov town is gate to recreation area called Czech Canada. Country side about Strmilov is ideal place for fishing, mushrooming, turistics and cycloturistics(Strmilov is part of cyclopaths Jindřichův Hradec - Telč č. 1113, Strmilov - Žirovnice č. 1240 a Český Rudolec - Kačlehy č. 1242). There are nature pounds suitable for swimming situated nearby. Aquaparks in Dačice and Jindřichův Hradec are also close to Strmilov. In winter you can enjoy skiareal in Mrákotín and Nová Bystřice or kilometers od cross-country skiing tracks. We can arrange fishing on private pounds or rent of bicycles for our hotel-visitors.